LAURA MJEDA ČUPERJANI (1971, Belgrade) graduated from the Department of Composition and Orchestration at the Faculty of Music in Belgrade, in the class of professor Srdjan Hofman. Laura began her pedagogical work at Music High School "J. Slavenski" in Belgrade and later at the Faculty of Music in Belgrade as an assistant at the Department of theoretical subjects. She has been working at the Academy of Music of Juraj Dobrila University since 2007 and as an assistant professor of the Course of Harmony, Arranging for ensembles and Basics of composition. Laura is a Head of Music Pedagogy/Education Department since 2013. Laura's composing opus comprises of works for solo instruments, chamber ensembles, orchestral works as well as music for theatre and multimedia projects. The selection of compositions: The moments for the guitar, Impulses for two pianos, Simple piano music for the piano (four hands), ...or...or....or… for the flute, violin and the guitar, lieds The Night and The House, Cycle The four annual words, Salve Regina for mixed choir, Sadness for a soprano, horn and a piano, Diptych for a soprano, mezzosoprano and a piano, Triptych for a mezzosoprano, cello and a piano, Talk to me for mezzosoprano, clarinet and an alto saxophone, 4 episodes for a string quartet, Strinx for a string quartet, Reverse for an accordion and a string quartet, Becoming for a solo accordion, Disaccordion for a voice and an accordion, Transaccordion for a chamber accordion orchestra, Masses for symphony orchestra, Versus, three pictures for an accordion and a string orchestra, Concerto for a guitar and chamber orchestra, music for theatre “Rotkve strugane” (Grated radish) and a choreographic project Masses. Her works have been performed in Croatia (Zagreb, Dubrovnik, Split, Rijeka, Pula, Opatija, Varaždin) as well as abroad (Paris, Verona, Trieste, Moscow, Kiev, Odessa, Gdansk, Mlawa, Vienna, Washington, Ljubljana, Belgrade, Podgorica, Pristina, Argjiro). She has participated in many events, festivals and projects: International Review of Composers - Novi Sad/Belgrade, Festival "Mediadance International" in Paris, Music Festival Opatija/Pula, The International Festival of Contemporary Music REMUSICA in Pristina, the International Festival Argjiro, 18th Mlawski festiwal akordeonowy Mlawa, Two Days and Nights of New Music – Odessa, Project -Days of accordion “New Waves” (Ljubljana, Trieste, Helsinki, Pula), Podium International Festival of Chamber Music (Brijuni), VaClaF International Festival of Chamber Music (Vareš, BiH). She exhibited at the Panel "New Works" organized by SOKOJ - Music Information Center of Serbia in Belgrade (1998), at the First International Symposium of Music Educators in Pula with the theme "The concept of teaching harmony in education of a music pedagogue" (2009) as well as at the Second scientific/artistic conference of assistants of Juraj Dobrila University in Pula (2001). Laura is co-author of the manual “Harmony on the Piano” published by University of Pula. She received various awards: for exceptional contribution in Academy of Music of the Juraj Dobrila University of Pula, for contributing in development of Music Pedagogy/Education Department on Pula Academy of Music, award "Vasilije Mokranjac" for the composition Concerto for a guitar and a Chamber Orchestra and a special award for original music for choreographic project Masses / Boulders in collaboration with the Theater of movement MIMART. 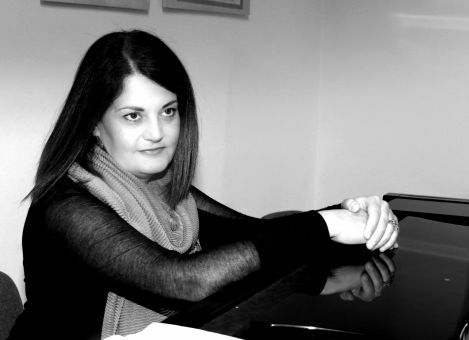 Laura Mjeda Čuperjani is a full member of the Croatian Composers' Society. The composition is written in a one-movement form with the principle of small static sequencing blocks. The main motive from the introduction is the primary carrier of musical shaping with repetitive procedures and minimal developments. This method of sequencing or alternating blocks is an effort to build the form which exists through the sameness. Several contrasting episodes were created due to the expressivity and coloristic possibilities of the ensemble. Strinx was premiered on 5th of June 2013 in the concert cycle "The Four Seasons - Summer" by Rucner String Quartet in the Croatian Music Institute in Zagreb, Croatia. It was published on a CD “It's Wonderful to Make Music” by Cantus - Croatian Composers Society.